In the morning, citizens burned cars, threw stones, and pillaged the mayor's office in the capital, Dakar. In the afternoon, they ran through tear gas and threw up their arms in defense as riot police beat them with rubber truncheons. 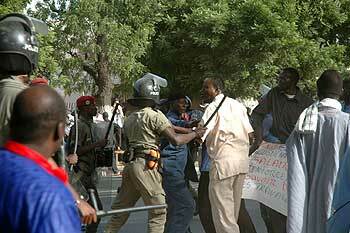 It has been six years since such serious riots in Senegal, generally a beacon of stability in West Africa. And both demonstrations came down to one thing: poverty. On Nov. 21, young street vendors poured into the downtown market area of Sandaga, protesting a move by President Abdoulaye Wade to force them off Dakar's busy streets in an effort to improve traffic flow. For months, the government has been giving Dakar a facelift, building new roads and hotels, as it prepares to host an international Islamic conference in March. Thousands of people from Senegal and neighboring countries fill the sidewalks of Dakar daily, selling art, shoes, electronics, and anything they can find, to make ends meet. The government has estimated annual losses of 100 billion C.F.A. francs ($226 million) because of clogged streets. "We are not against [the president's idea], but on the condition they give us a space to set up our stalls and sell our things," said Fallou Seck, delegate of the collective of street hawkers. "We are citizens who have the right to work." The World Bank considers that one in three Senegalese is poor. Unemployment rate estimates are as high as 40 percent, and the vast majority of jobs are in the informal sector. After an afternoon meeting between the prime minister, the mayor of Dakar, and a delegation of street hawkers, Senegalese authorities said the government would open two streets for the vendors on weekends and authorize a certain number to reside in three areas of the capital, through a new licensing office. But the announcement came only after protestors shut down the city's main arteries with barriers, setting tires and piles of garbage on fire, and hurling stones at boutiques whose owners refused to close their shutters and join the demonstration. Marchers set fire to cars and shattered windshields, destroyed traffic lights, and pillaged the mayor's office and the national electricity company, Senelec. Police, responding with tear gas, arrested around 200 people. Private radio reported two people were seriously injured by bullets. "If nothing is done, other big protests will follow," said Galass, who sells children's toys. "I'm not scared of going to prison, because we are defending our right to work. That is our rallying cry … Our poor relatives in the countryside depend on our labor as well." The same day, members of Senegal's 18 unions took to the streets in a previously planned and authorized march protesting the high cost of living. After the morning riots local government withdrew authorization at the last minute. Mostly peaceful, marchers were nonetheless met by police using tear gas, warning shots and rubber truncheons to disperse the crowds gathered on Général De Gaulle Avenue. "Prices of basic commodities have reached incomprehensible levels," Mademba Sock, coordinator of the United Front of Central Unions representing 14 of Senegal's unions, told IRIN, pointing to increases in the price of rice, sugar, milk, and bread. Union representatives demanded a reduction in food and housing prices, an increase in salaries, and support for struggling businesses. Demonstrators included teachers complaining of empty government promises, public servants let go without pay, and average citizens who simply cannot afford to feed their families. "Senegalese people do not eat three meals a day," said Fatou Samba, a former teacher. "The president spends millions of dollars here and there while his people are suffering and dying of hunger." "I haven't paid my rent in a year," Yankhoda Sané, a launderer who makes 10,000 C.F.A. francs ($23) a month, told IRIN as he marched with the crowds. The protests were a sign of rising dissatisfaction with the ruling party, which recently announced it would reduce the salaries of President Wade and other high-ranking government officials. "In my home, there are eight people," said teacher Cissé Sow. "I pay the water, electricity, phone, medical care, and food. It's one salary … And there are 30 or 40 other people who depend on me. "Meanwhile, the people in power are all driving fancy American cars," Sow said. Youths at the demonstration blamed poverty for the flight of the thousands of Senegalese who every year risk their lives on rickety boats to get to Europe. "If there are so many youths going to Spain, it's because life is too expensive here," Samba Gaye, 26, member of the association Halt to the Clandestine Emigration of Youth, told IRIN. "Youths no longer have the means to [ensure] their own subsistence." The rate of inflation in Senegal was 5.6 percent during the first 10 months of 2007, according to the National Agency of Statistics and Demography. "West Africa: High Prices of Food Imports May Leave People Hungry"
Smaller protests continued the morning of Nov. 22 in downtown Dakar.